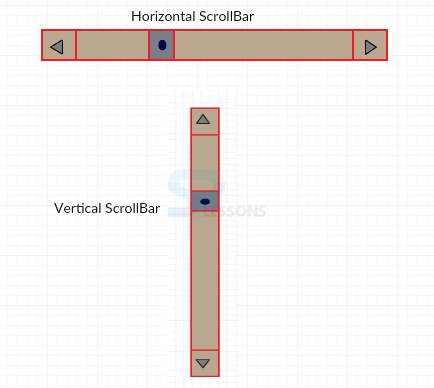 ScrollBar scrolls vertically and horizontally from its default value by setting the minimum and maximum values. It consists of a box, which does not have any value to display except scrolling. Initial value The slider is set to the initial value. Default value is set when being used. Alignment This decides whether to scrol vertically or horizontally. Scroll box size It represents the size of the slider. It is the result of difference between the maximum value and the amount visible. Unit increment, Unit decrement This value gets incremented or decremented when clicked on the end arrows. The default value is 1. 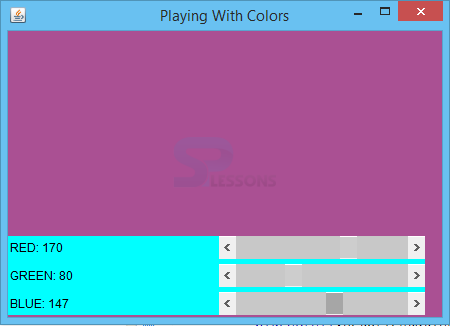 Block Increment, Block Decrement The scrolling value changes and moves as per the changed value. The default value is 10. Minimum value and Maximum value These values indicates the range of scrollbar. Exceeding these values, the scroll bar cannot be scrolled. AdjustmentEvent is generated when scroll bar action is performed. This is handled by the AdjustmentListener, which overrides the adjustValueChanged() method. 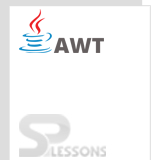 AWT Scrolling is done vertically or horizontally. Slider moves between the minimum and maximum values.